The White Train returned to action at Aberfeldie on Saturday, 20th of November for Round 6 of Athletics Victoria’s Shield competition. 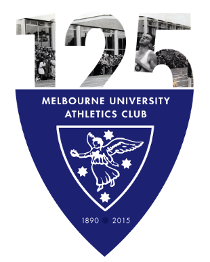 Several rained out rounds and weeks of examinations left athletes keen for competition and there were some strong performances from Melbourne University Athletics Club athletes. The team’s focus for the week was on filling all scoring positions and the effort paid off with the women filling 83% and the men 85%. The benefits were immediately apparent with the White Train claiming first in both Men’s and Women’s Division 1 (in provisional results). The MUAC men have extended their lead at the top of the ladder and the women are in a clear second place. 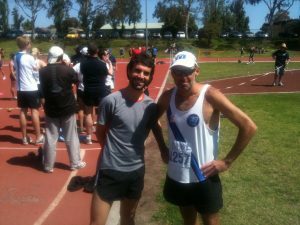 Paul Kennedy led the field on a merry dance in the 3000m walk, claiming victory in 14:08, giving him time to encourage first time MUAC walkers Matt Irons and Johanna Ziegel. MUAC claimed the double in the high jump with Hannah Alderton winning the women’s with a leap of 1.75m and MUAC Men’s team captain Mitch Mackenzie winning with a 1.85m clearance. Jarrod Pageot, training squad mate of Mackenzie and Alderton, claimed victory in the long jump with a leap of 6.93m. Women’s team captain Jacquie Sharples stepped out of her comfort zone and ran an 800m and 3000m race for the team, a lot further than the 400m or pole vault run up that she is accustomed to. The MUAC calendar is packed for the next month with three rounds of Shield competition, the MUAC Christmas Gift, Victorian Milers Club meets, the 50th Anniversary Zatopek:10 at Olympic Park, the very social Friday Night Bowls, Victorian Relay Championships and more.